The walk of life is a used to introduce DNA-v to a young person, parent or class room. You don’t have to do it exactly like this, it’s just a guide to get you thinking. This introduction is done with one person, either a volunteer from a group or class- room or an individual in therapy. You first write the letters D, N, and A on three sheets of paper and place them on the floor in a circle. Space them at least a few steps apart. Don’t explain what’s happening at this point. Let the curiosity build. This A stands for advisor. It’s something we all have. I have it. You have it. It’s that inner voice in our heads, evaluating everything and trying to tell us how good or bad we are. Have you ever seen a movie where there’s a little creature sitting on someone’s shoulder, whispering in the person’s ear? It’s kind of like that. Write your evaluations on the piece of paper with the A on it, then have the young person write her evaluations, encouraging her to really think about how the advisor evaluates. What we just did is the most important skill in our work. If we feel stuck, we move to something else. Whenever you’re stuck, you can move—you can do something new with your hands and feet. Okay, so here we are. N stands for noticing. This is a space we can move to when we feel stuck and want to increase our awareness of where we are and the choices available to us. Let’s do a noticing practice right now. Have the person take a few slow, deep breaths, just noticing the breath for a moment or two. Then ask her what it’s like to be in this space. Also ask whether she can notice a difference between the advisor and the noticer. Explain that we all have the ability to be a noticer and we all have an advisor. D stands for discoverer. This is where we try new things and see what works. It’s where we discover what we care about. We can be discoverers even when our advisor says we can’t be. For example, has your mind, or advisor, ever told you that you can’t do something, but you did it anyway? When you did that, you discovered for yourself whether or not you could do it, instead of relying on the advisor. We use our DNA skills in the service of what you care about. I call this valuing, or values. Values might be having fun, playing sports, or connecting with others. It just depends on the person. For each of us, everything we do is in the service of this. So everything we do in our work together will be about helping you to have more things you care about and value in your life. From: The Thriving Adolescent. (L. Hayes & J. Ciarrochi). Buy it here at cost price!! Our aim is to get this work out to as many young people as we can. 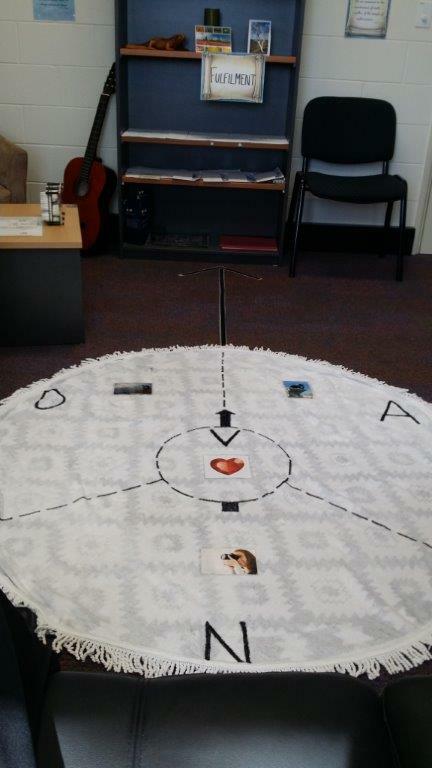 Or step onto Kingsley’s magic carpet …..
Lots of people are coming up with great ideas on how to use DNA-v with young people. We LOVE to hear about this, so we can share them with you. Kingsley, an Australian in Queensland, shared the following with us. Now, I must first add that he did not call this his “magic carpet”. We did. We loved it so much we called it that. In my experience thus far, having the model mapped out physically on the floor, and getting the client to walk around in their own ‘headspace’, appears to be really powerful. I purchased a 1.5m circular beach towel and used fabric paint to imprint the basic DNA-V diagram on the towel. The towel is now a fixture on my consulting room floor (see attached picture). I use a bit of Velcro to keep it in place. I’m gradually creating a collection of laminated images that can be placed in relevant places on the beach towel, to represent different aspects of the client’s experience (hopefully the attached pictures will give an idea of how this works). The Discoverer space really adds something extra to the way I have previously practiced ACT, especially when working with adolescents, who I think by nature are meant to be experimenters/explorers/ discoverers. I love the idea of encouraging adolescents to not only experiment with new behaviors, but then to pause and reflect on whether or not the new behavior enhanced their life/vitality in the long run. We would love to hear about your adaptations on DNA-v…. do drop us a line.